Why Has Obama Ignored Latinos for Top Jobs? About four years ago, I wrote a column praising President Bush for appointing Latinos to the Cabinet as he began his second term. 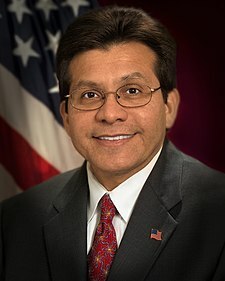 The most obvious example was Bush’s decision to nominate Alberto Gonzales as attorney general, which many liberals would insist was a big mistake. I disagree. But that’s an argument for another time. This much can’t be argued: Gonzales represented a major breakthrough. You see, all Cabinet posts are not created equal and, before Bush broke the barrier, no Latino had ever been nominated for one of the top four jobs — defense, state, treasury, or attorney general. A whole succession of presidents — including Democrats such as Jimmy Carter and Bill Clinton — who had munched nachos and posed with mariachis on the campaign trail, and enjoyed substantial support from Latinos, had somehow missed the opportunity to seat a Latino at the grown-ups’ table. Imagine that. You are currently browsing the archives for the Latinos category.